Safety warnings as clocks change | What Car? Drivers and pedestrians are being warned to take extra care on the roads this weekend as the clocks go back to signal the end of British Summer Time (BST). The sun will be setting an hour earlier from Sunday, October 25, which means that children will soon be making their way home in the dark. Drivers are advised to turn on their lights before it's fully dark, and to take particular care where children may be on the streets between 4pm and 6pm. Children are being urged to 'Be Bright, Be Seen' by the Department for Transport in a road safety campaign launched today. Last year, 867 children, aged six to 11, were killed or seriously injured on the UK's roads. 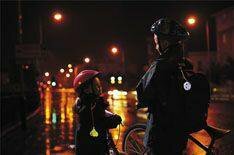 Children are advised to wear bright or fluorescent clothing in the daytime, and reflective gear if they are out after dark. There's substantial evidence that fewer people would be killed and seriously injured on Britain's roads if the country were to put the clocks forward by one hour throughout the year, according to a report published yesterday by the House of Commons Public Accounts Committee. It recommended that the Department for Transport (DfT) looks again at changing current policy. The new system where clocks would be put one hour ahead of GMT in winter, and two hours ahead in summer, has been dubbed 'Single Double Summer Time' (SDST). A DfT spokesperson said: 'A wide range of issues would have to be taken into account if a move to SDST was to be considered, of which casualty savings is just one.